Participants shall be given Post Training Work to ensure transfer of learning. This comprises of 30-day whats-app support. Please fill up the form on the right. Although the charges for the workshop are INR 9000/-, there is a 50% discount so you need to pay: INR 4500/-. You may give us via cheque, EFT or PayTM (9999598964). Atul has an overall experience of 20+ years and he is a certified ISTD Trainer, Counsellor and Coach. 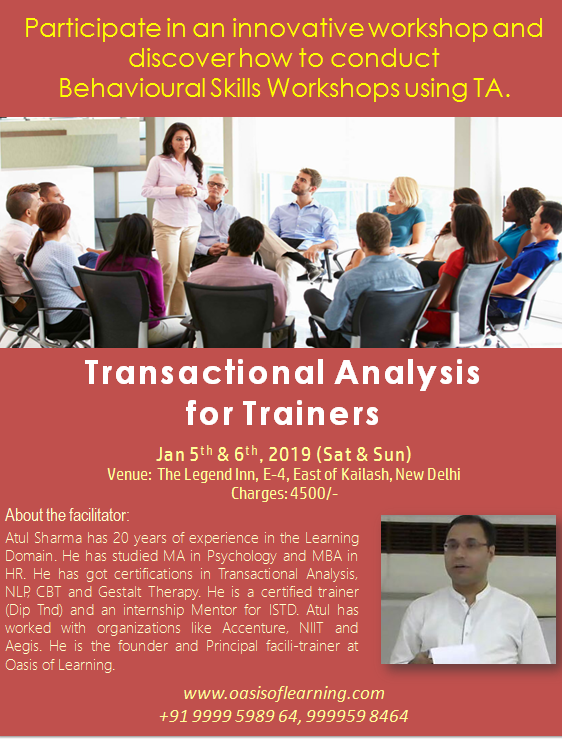 He has finished his Masters in Psychology and is trained in NLP (Neuro linguistic Programming), TA (Transactional Analysis), CBT (Cognitive Behavior Therapy) & Instructional Design. He has facilitated workshops for organizations like Deloitte, NIIT and Jaquar. For his complete profile, you may click here. Please contact us at 9999598964 or 9999598464 for any queries.